Manama: Air traffic at Kuwait International Airport is still temporarily suspended on Thursday, due to unstable weather conditions hitting the country. Kuwait News Agency (KUNA) reported that arriving flights have been redirected to other airports in nearby countries due to heavy rains and poor visibility. Flights are being redirected to Saudi Arabia's Dammam and Riyadh airports, and to Bahrain's Manama airport. Kuwait suspended all departing flights from the capital's airport since late Wednesday "All flights departing from Kuwait international airport are suspended 'Precautionary', and arriving flights will be redirected to Dubai international airport, Bahrain international airport and Dammam airport" the Kuwaiti civil aviation said In a statement carried by state news agency KUNA. Kuwait’s ministries, departments, universities and public and private schools will remain shut as a precautionary measure against expected heavy rains. The UAE Embassy issued an advisory on Wednesday, urging Emiratis in Kuwait to follow safety instructions issued by relevant authorities. The country is still grappling with the political, social and economic fallout of the recent downpour that has caused the death of a person and heavy damages to public and private properties and led to the resignation of a minister, the dismissal of senior officials and a motion by a lawmaker to grill the prime minister over alleged state mismanagement of the disaster. The decision to shut down all public facilities as forecasts expect heavy rains and high speed winds, aims to ensure people’s safety and to allow the authorities to deal with emergencies more easily since there will be no traffic congestion and slowdown. Kuwait meteorologist Issa Ramadan reported that the amount of rain falling till today have broken the record of 1997, marking 64.1mm back then and today its 245mm more than triple, on Kuwait Tv. A list of several shelters across the country were put up to provide people with better protection and alternative roof in case their houses were flooded. 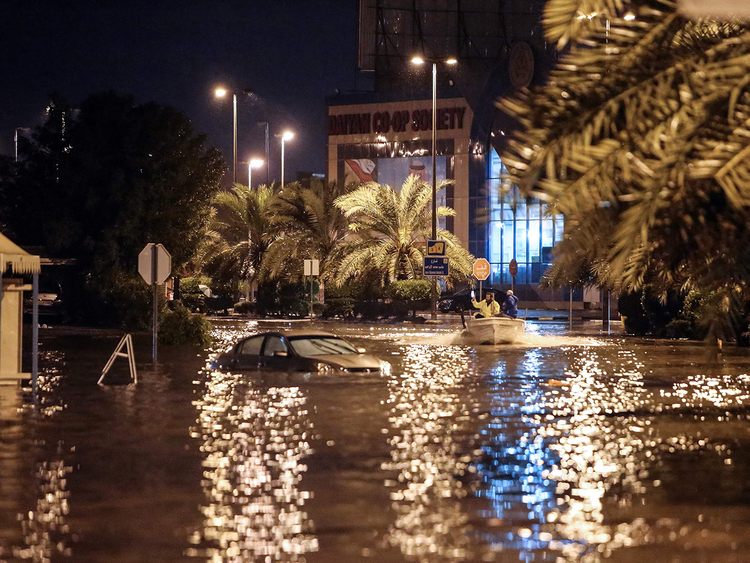 One Kuwait resident tweeted describing the storm as historical "Last night Kuwait got historical rain storms. We awoke to flooded roads and confused locals who have never seen this kind of flooding." Kuwaiti have also taken to twitter with a high sense of humor one user published a poster saying "You think its London"
Another published a picture of how depicting how Kuwaitis embrace a storm. However, beside the logistics, another issue for the government is how to deal efficiently with the fake news and allegations circulated on social media that contribute to creating an atmosphere of grave concerns and apprehension among Kuwaiti citizens and expatriates. Several calls were issued to ask people not to heed unofficial claims and to rely on official sources for information regarding the weather conditions and the situation in the country. Kuwait Television was told to keep viewers updated on the latest details, warnings and statements. The head of emergency at the information ministry said that his team was in permanent sessions to report live on the weather conditions. Reporters have been assigned to different locations to report on events and on the latest developments, he added. A parliamentary session scheduled to discuss the situation with the government at the request of some lawmakers was cancelled due to lack of quorum.